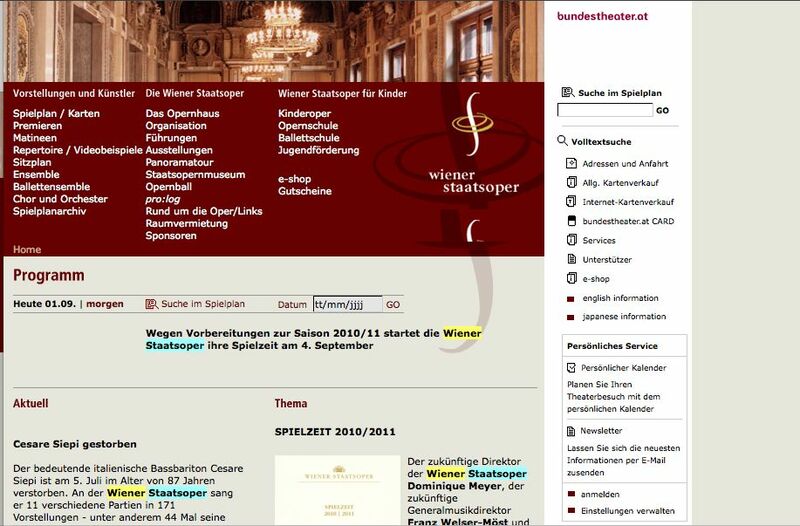 Today marked the first official day of Dominique Meyer’s directorship at the Wiener Staatsoper, but I think he’s already figured out where the coffee machine is. * There are two exciting and discussion-worthy news items already. Screen is located on the Kärtnerstrasse side. The house has announced live video broadcasts of 16 performances onto a giant screen on the side of the building. This will include the new production premieres of Cardillac, Lucrezia Borgia (in concert with Edita Gruberova), and ballet program Juwellen der Neuen Welt, as well as revivals of La Bohème, Zauberflöte, Tannhäuser, Pique Dame, Tosca, and the ballet Onegin. You can check out the full schedule here. I wonder if I can time my trip home so I can catch “Dir tone Lob” on the way? I will do my best to get some video from these if they are exciting. And if I’m not, you know, inside the opera house at the time. Hope for good weather. 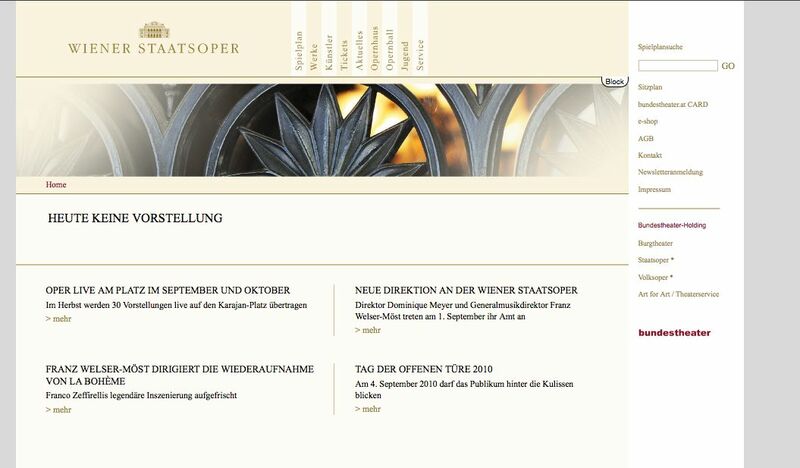 Continue for exciting new and overdue adventures in opera house website design. Let’s hope for my sake that there will be accessible press photos, because I want to illustrate my posts. If only I could find the press section. Oh well, these things take a little while to sort out. I will be reporting live (so to speak) from said opera house next week. *The Austrians have the BMWs of coffee dispensers. I think the one in the ÖNB offers six different blends.